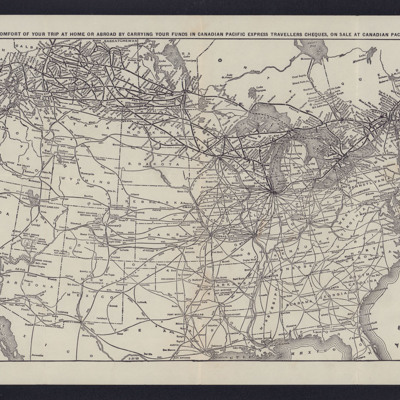 Spatial Coverage is exactly "United States"
Railway map covering Canada and the United States listing Canadian Pacific passenger and freight agencies in the United States and showing location of Canadian Pacific Hotels. 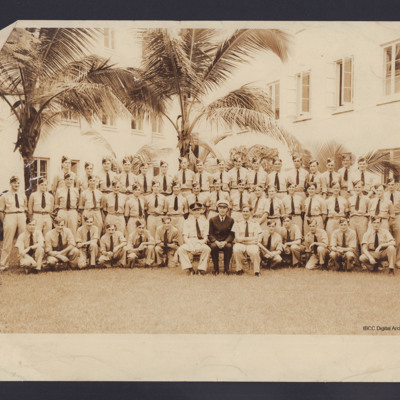 He refers to the end of the war and meeting English RAF cadets. He writes fondly of Fred, too. 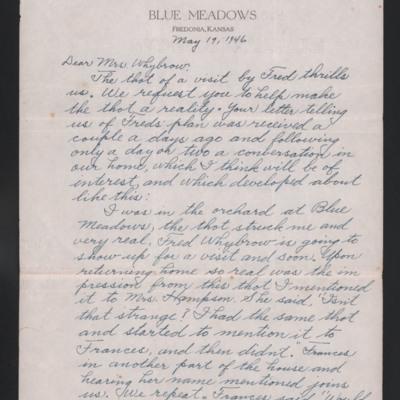 The letter refers to a surprise and encloses a copy of the letter and a photograph. 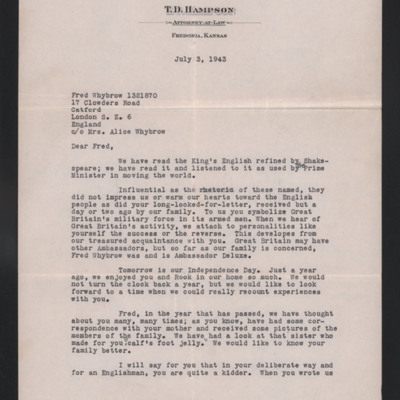 Letter refers to Independence day, Frances home from hospital, house painting and offers accommodation if Fred and his colleagues can come over. 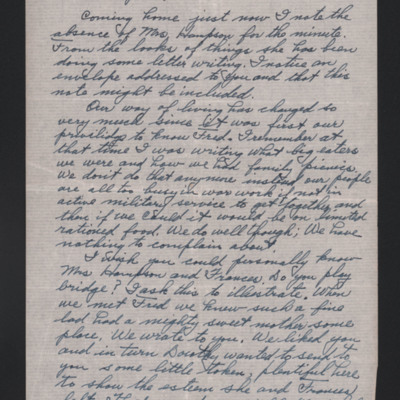 Letter to Fred refers to Ted's daughter, Frances having operations to both eyes. Also thanks him for the photographs. 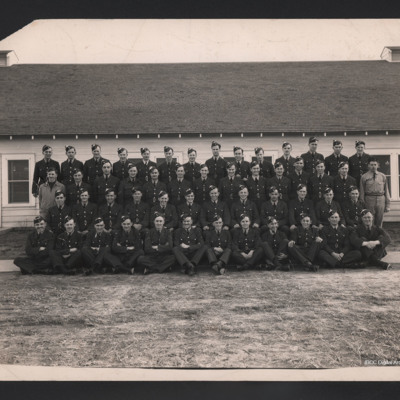 52 airmen arranged in four rows in front of a wooden building. They are wearing sidecaps with a training flash. 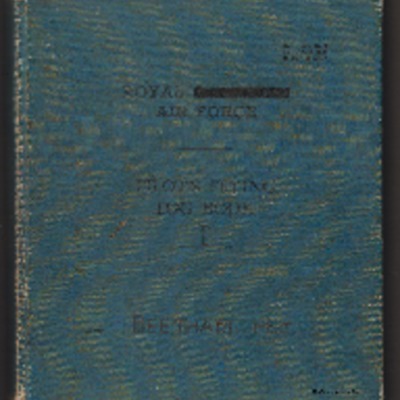 On the reverse is 'RAF Friends'. 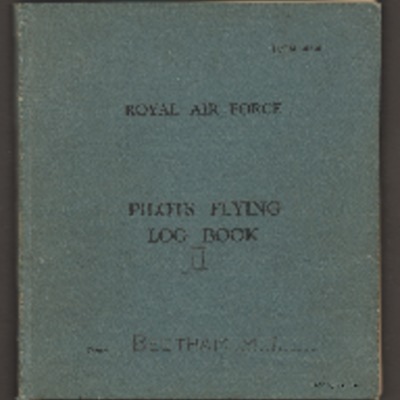 On the reverse of the second photograph is ' RAF. Friends Miami, Oklahoma 1942'. A side view of four training aircraft in a straight line. The nearest is 'B.35' and the next is 'B.24'. Two airmen are located close to the first aircraft. 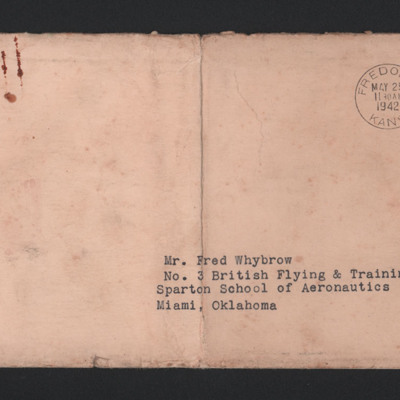 On the reverse is 'Stearman PT13A Miami Okla'. 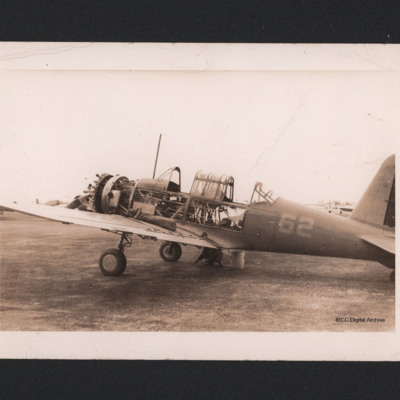 A side view of a training aircraft '62' stripped for inspection. 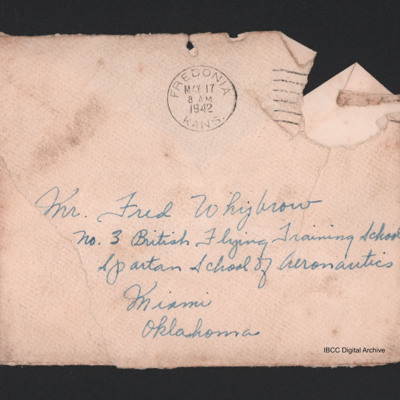 On the reverse 'BT17A Miami Okla'. Two airmen and a woman sitting in a field. It is captioned '"In the Flax Field" Fred Whybrow Bernard Rooke Frances Hampson July 5, 1942'. A street scene with several cars angle parked into the pavement. Behind is a series of low connected buildings. 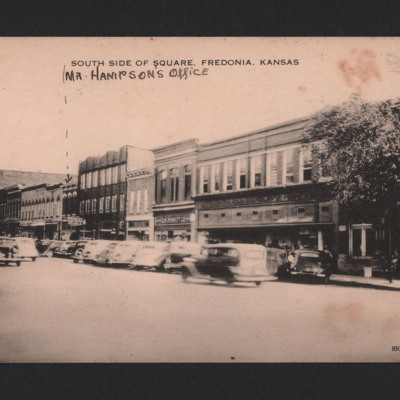 It is captioned 'South side of square, Fredonia, Kansas' and annotated 'Mr Hampson's Office' with an arrow pointing to his office. 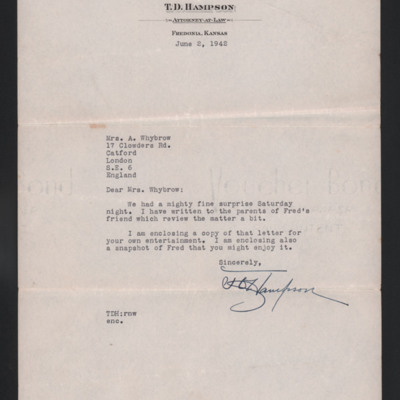 The letter describes a letter from him and their visit to Fredonia, especially the dance. She refers to Mr Rooke and Sgt Whitefield and a Prom, tennis and roller skating. 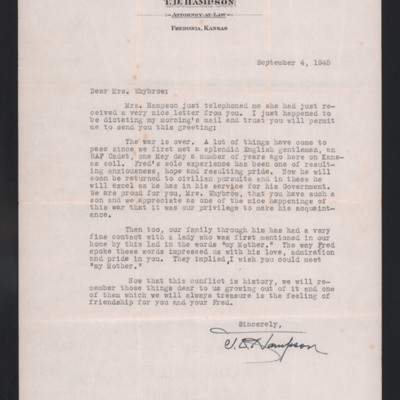 The letter refers to a proposed visit to their house by Fred. The end of the letter is missing. 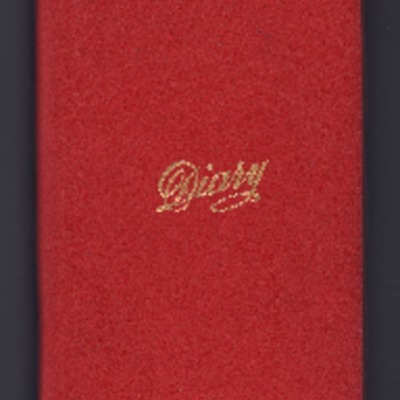 The letter refers to the decrease in eating, particularly picnics and wartime activities. He expresses a desire to meet with Mrs Whybrow. 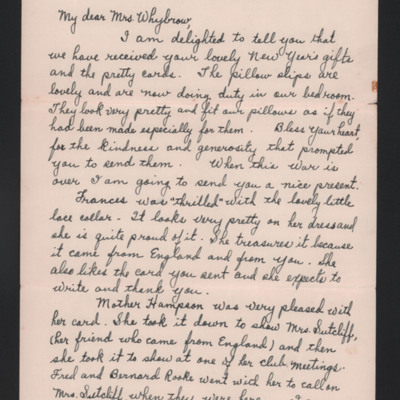 The letter praises Fred for his treasured visit to their house. He complains, gently, about the lack of letters from Fred, contrary to what he had promised. 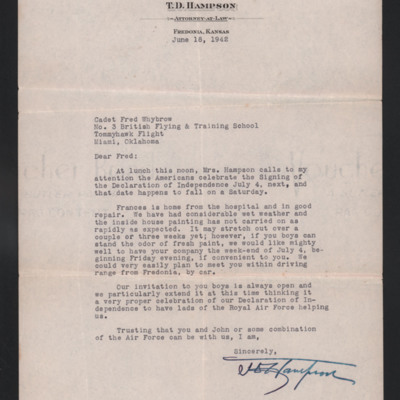 The letter asks that Fred makes a return visit to his house. The letter thanks Mrs Whybrow for the New Year's gifts - pillow cases, a lace collar for Frances and cards. She mentions the introduction of food rationing. 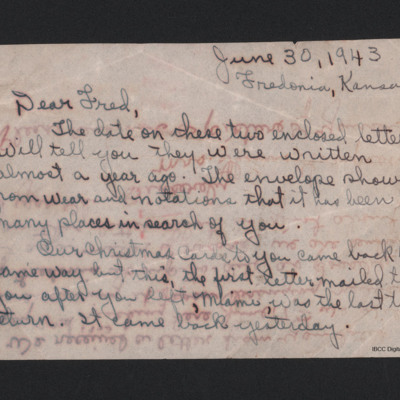 The letter refers to lost and returned letters and cards. The writer asks Fred to send her a photograph of himself. Postcard to Rosemary Chadwick from Roy Chadwick written while airborne between Los Angeles to San Francisco. Sends love to all. Postmarked Seattle, Washington State. 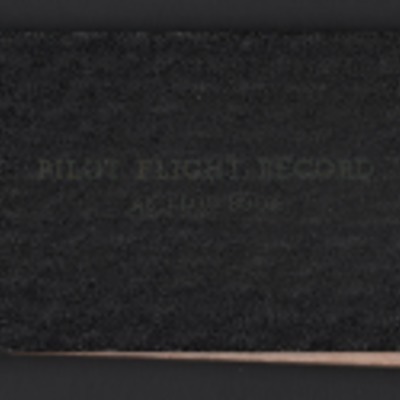 On the front a photograph of a United Airlines DC 3.